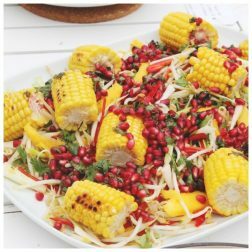 This crisp, fresh, sweet and sour salad is the perfect summer companian for all your al fresco meals. It’s great for sharing. Just add some salad servers and get your friends to dig in. Serve alongside BBQ meats, sweet potato wedges, falafel and crusty bread to suit all your guests foodie requirements. You could even BBQ the corn and season with cracked black pepper and tamari afterwards for extra flavour.